Joshua Hankey, CEO of Royal Square Development and Construction, presents a proposal for use of the Market House to the Public Works and Property Committee at its September meeting. A second proposal for the Market House envisions it as a venue for weddings, corporate events, and special occasion parties. Joshua Hankey, CEO of Royal Square Development and Construction, made the proposal at the September Public Works and Property Committee meeting. Hankey had originally been invited to this month’s borough council meeting when CHI presented its proposal but was unable to attend. Hankey said Royal Square wants to engage with the borough to develop and manage a wedding and event venue at the Market House. Under the proposal, Columbia Borough would retain ownership of the building and keep it available to the public Sunday through Thursday but would set aside Fridays and Saturdays for weddings and events. Hankey said the undertaking would require an investment in construction and redevelopment of the property from Royal Square. The company’s partner, JDK Catering, would also be involved. 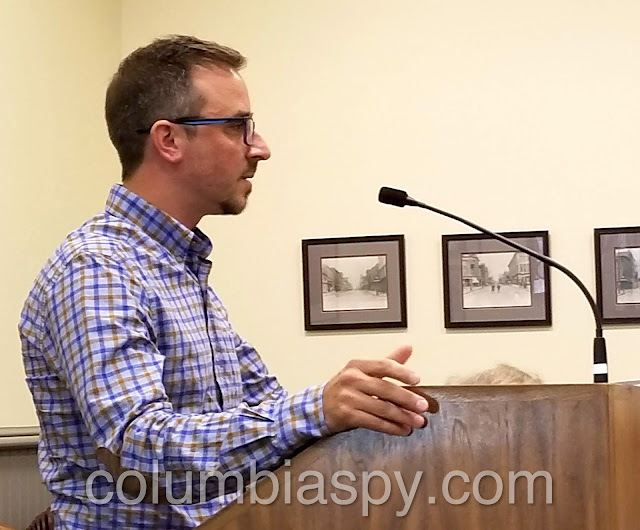 Hankey explained that he was approached two years ago by Janice Nikoloff of the Columbia Economic Development Corporation to look at the vacant Hotel Locust building on Locust Street. His first thought was to open a boutique hotel there, but he had reservations due to the lack of retail and restaurants in Columbia and felt that redeveloping the property was “a little risky.” Nikoloff subsequently directed him to the Market House which he thought could be redeveloped and could drive traffic to Columbia and then increase the developability of Hotel Locust and other Columbia properties. “You’re looking at more than a half a million dollars of economic development directly to the locale from something like this,” Hankey said of the Market House project. He cited the building’s location: right in the middle between York and Lancaster, 35 miles south of Harrisburg, 65 miles north of Baltimore and a little less than 100 miles from Wilmington and Philadelphia. “It’s a good location,” he said. According to Hankey, the venue would be named, appropriately enough, “The Market House.” For the proposal to work, the building would need to be able to seat 350 guests. A catering area would also be required. Currently, the building is not big enough to accommodate such an area, so a catering tent would be erected in the alley (Sadie Lane). The alley would need to be abandoned and would become part of the venue. The historic integrity of the building would be kept intact, except for HVAC condensing units that would be “hidden” on the building’s south side. Inside, brand new bathrooms would be added, as would a groom’s room and a bride’s room. The existing brick floor would be pulled up and relaid to make it flat, and a sprinkler system would be installed. The entire interior would also be repainted. JDK Catering would take care of all marketing. Renters would be required to use JDK for catering when renting the venue. Renters could provide alcohol, but it must be served by JDK. Tables and chairs would be stored on site. Hankey said there are 34 parking spaces in borough lots around the building, plus more than 70 spaces in and around Columbia River Park to accommodate visitors to the venue. He added that Holy Trinity has a 70-space lot that could be used on Friday nights only. (The lot would not be available on Saturday nights due to Mass.) Visitors would walk or be bused from the more distant lots, with expenses to be borne by the renter. Since Royal Square is a construction company, it would carry out construction but would waive development fees (5%) of the total project cost, which in this case would be $46,000, according to Hankey. He estimates a total cost of $930,000 “to do what needs to be done.” Choosing to use a Redevelopment Assistance Capital Program (RACP) would add another $157,000 to the cost, due to state requirements. Borough Manager Rebecca Denlinger explained that a RACP is a grant from the state for economic development projects. “We put a line item in for three different projects for potential RACP funding. We did name the Market House in that application,” she said. Hankey predicted a total revenue of $51,000 for 2019, with a net to the borough of $8,000. Utilities and maintenance are not included in the projections. Hankey proposes a development agreement with an attachment specifying the management agreement for a term of 5-years, with a possible option to renew. Mayor Leo Lutz estimated it would take 15-20 years to see a return on investment, and Hankey concurred. Hankey said that if the proposal is approved in the near future, construction could begin in early 2019 and be completed by late April, in time for the wedding season. I'm having trouble understanding why the borough did not want to put money into the market house when it was a market. Sinks, air conditioning, and other upgrades, but now they can't open our wallets wide enough. The borough puts every thing it can get away with in the money pit, and to hell with the rest of town, the pit is big enough and paying 115,000 to manage it is well lets let you figure that out. Mr Spy- what do you think the borough should go with- Market as a Market or Market House Wedding venue?